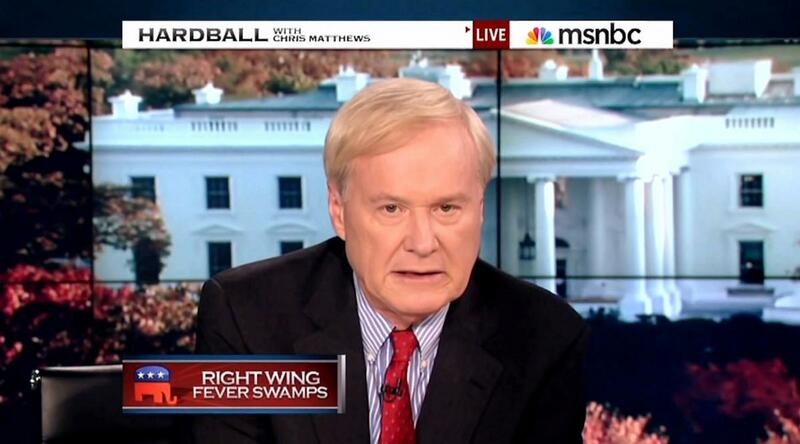 Liberal cable anchor Chris Matthews, who in 2010 used the phrase "shuck and jive," on Wednesday assailed Sarah Palin as racist for using the phrase "shuck and jive." Referring to a Facebook post the former Alaska governor wrote about Obama and Libya, Matthews ranted, "You know, a dog whistle is a dog whistle...A trumpet call is another." The MSNBC host insisted that "shuck and jive" has "a particular ethnic connection" and "to throw it at the president as an ethnic shot is pretty blatant." On July 7, 2010, Matthews, while talking to Rachel Maddow about her visit to Afghanistan, wondered, "What has it been like, as you shuck and jive, hang out with the men over there, the women over there, in uniform risking their lives every day?" The late Tim Russert also used the term on July 18, 2003. In 2008, then-New York Attorney General Andrew Cuomo said of Barack Obama: "You can't shuck and jive at a press conference." Steve McMahon, a Hardball regular, talked to then-MSNBC host Tucker Carlson and demurred, "Well, that's not the way I would have put it." On September 7, 2011, Jay Carney, a spokesman for Matthews' beloved Obama, told the press corps, "Sorry. I'm going to shuck and jive! Time to shuck and jive." 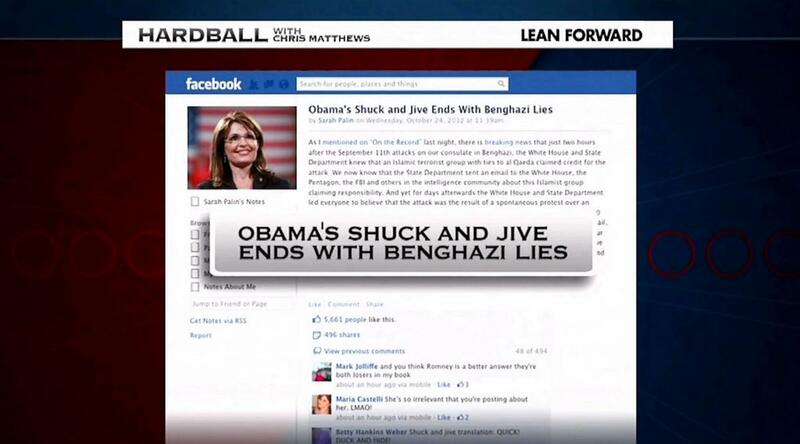 Palin entitled her Facebook post, "Obama's shuck and jive ends with Benghazi lies." On Wednesday, Hardball guest Jonathan Alter, a former Newsweek editor, railed against Palin, "...Shuck and jive, that's like talking about watermelon... for Jews, talking about Jews are greedy or the Irish are drunk." Apparently, shuck and jive is only racist when conservatives say it. JONATHAN ALTER: Chris, I actually think my old friend Clarence is being a little bit polite. I think this is rank racism. You know, sometimes people on the right get very upset when people on the left charge racism, but, you know, shuck and jive, that's like talking about watermelon or, you know, for Jews, talking about Jews are greedy or the Irish are drunk, whatever. These are racist tropes and we need to call them what they are, and I actually think at least implicitly Trump was playing on racism today with his ridiculous stunt demanding Obama's college transcripts.